Good (Tuesday) evening, Paul here. This is a placeholder article for Weds morning's RNSs, so that readers can post your comments in advance of me writing the main report. See you in the morning! Best wishes, Paul. Good morning! Paul here. I'm a bit pushed for time this morning, as I have an investor lunch shortly. So I'll work through as many stocks in the header as possible, and then finish off any stragglers this evening. Q3 trading update - not a small cap, I know! However, traditionally I report on this company's updates, as they're so full of useful information, and have read-across for the general retail sector. Full year (y/e 31 Jan 2018) profit guidance remains unchanged, but the lower & upper ranges have both been tightened by £5m. EPS forecast is now in the range of -10.0% to -3.5% versus last year, little changed from previous guidance. Normally I scoff at retailers blaming the weather. However, in this case, Next has a well-deserved reputation for being absolutely straight with investors. Next tends to tell it like it is, hence why its updates are so worthwhile to follow. I'd go with Paul's other advice, "retail clothes, it's tough"
The market is pricing in a 90%+ probability for tomorrow's rate hike. But beyond that there's less certainty. The market is also pricing in a possible rate hike next May/June but there's no consensus that increase is needed. Regardless, that's the only rate hike that the market is currently pricing in for the whole of 2018. Hi Paul. It would be interesting to get an insight into your portfolio structure. Some of the investments that you have made in BMUS are quite high risk. Do you offset this with less volatile (and higher liquidity) investments in your personal portfolio (are you more of a value investor at heart as suggested by your Next holding)? Do you stick to some kind of portfolio structure/ weighting rules? Personally I'd take £BEG's commentary with a pinch of salt. Looks like somewhat overblown hyperbole to me. It's about time a number of zombie companies went to the wall - creative destruction and all that. With high levels of employment and inflation trending up a small rise in interest rates might help achieve this. Consumer credit rise needs to slow but unlikely to be a bubble bursting. Begbies have been waiting for a downturn for 7 years. I think they'll be waiting a little longer - though of course I could be wrong. I always find your comments on the High Street and the likes of Next (LON:NXT) really interesting. I am however much mopre pessimistic on the "high street" and would imagine, it to all intents and purposes, not existing in the medium term outside of, perhaps, major shopping destinations, Oxford Street, Knightsbridge etc (sorry I an London centric). We have had video (Blockbuster), music (HMV), books (Kindle will win in the long term IMO), sotware/games, newspapers, magazines, cinema (the decline in cinema visits in the US is staggering). I just think that the standard high street is next (no oun intended). The likes of Next (LON:NXT) might be able to transform to a largely internet based business but can it deliver the same volumes and profits? I for one certainly can not say. I speak as somebody (who actually likes shopping) who can not really remember the last time he made a purchase offline excepting the weekly grocery shop. Online (mainly £AMZN) is just too easy. So I would definately not be long Next (LON:NXT) Debenhams (LON:DEB) Marks and Spencer (LON:MKS) but that is what makes a market! Regarding falling high street rents, this is indeed a key reason for buying retail at the moment, be it Shoe Zone (LON:SHOE) and Next (LON:NXT), but there is still competition for high street space. In my city a large amount of both obsolete retail and office space has been converted (as Paul said) to residential (mostly for students), but also to leisure such as restaurants and gyms. City / town centres are currently finding a new equilibrium driven by the internet, relaxed planning rules for residential conversion and a continuing trend towards city living. It is not entirely clear where this will leave values in the medium term. Interest income is £105m for the half year. Given that full-year operating profit in 2016/17 was £827m, it seems fair to suggest that interest income from credit customers was 25%-30% of the group's operating profit. What's concerning me (as a shareholder) is why the firm has stopped breaking out this info. What is management trying to hide? Falling interest income or falling Directory sales? Or both? Disclosure: I own shares of Next. Thanks for the update. It's very interesting (and I have found it profitable) to understand the reasoning behind your trading. Have you calculated that from the gilt market, or in some other way? What an interesting find Zotefoams (LON:ZTF) looks. Thanks largely to a few mentions around these parts, I have recently read (and am now re-reading) Mark Minervini’s book. I have to say it has been a somewhat "emotionally challenging" read, but as part of my recent focus has been to resist my weakness to buy too soon, the methods a least chime in part. Minervini is more : “What a bargain [very different definition], I should think about buying once the market clearly starts to wake up to it”. Anyway the link here is that Zotefoams (LON:ZTF) looks to me as though it could have the characteristics of a Minervini “superstock” (in fairness I am probably about 100+ hours short in my research to really make that claim). It has a good trading statement (“earnings surprise”) confirming ongoing progress. One could also perhaps quibble as to whether revenues being “above” whilst profits are only “at the top end” raises any question marks. I’ve just got a slight nagging doubt on the base that some of the down days were on relatively high volume; I’m not totally sure of the implications of that? Possibly an indication of more volatility than would be optimal. Anyway as the chart implies I’ve bought some earlier today, and I will likely be buying more if the price continues to go up. (actually it’s not quite as simple as that, but I couldn’t resist making such an outrageous statement that would have been unthinkable for me a year ago). This all probably reads a bit “rampy”, so some important qualifications. This is my novice interpretation of the Minervini approach so flaws are clearly possible. (In fact it would be great to read views from anyone that does follow the Minervini method). I think Minervini himself infers that his hit rate of finding winners is only around 50%. (It is his risk management & timeframes that deliver his super profits). Edit : I just noticed the price ticked up further whilst I was writing that, so that last candlestick is too low! Very interesting to see that breakdown. 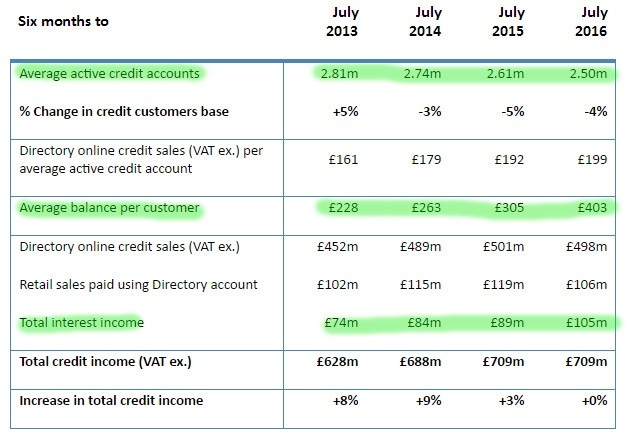 It looks like credits accounts were already consistently in decline. I therefore suspect interest income may also have been declining. Omitting the analysis does tend to imply the management would rather not draw attention to it, possibly for fear of signalling online and bricks and mortar declines? Thanks Roland, this is really helpful as I was struggling to find the data myself (searching for the wrong term in the search box). It confirms my slight concern that profits could be vulnerable in any credit bubble and I also think it's only a matter of time before there is some kind of regulatory action by the Government. Paul; many thanks for covering WEY & the above links, full marks for finding the Student Link , an excellent reference even if she does get a small 'bung' for doing it ; a very self assured confident & charming young lady, a perfect testimony. However still more work to do to determine just how strong the structure is & the strength of the shoestring. "Have you calculated that from the gilt market, or in some other way?" I work for an investment bank. I asked our sterling desk yesterday for their view on the sterling market and that's word for word what he said, absent his comments about Brexit, the UK economy and the direction of equity markets which were more opinion than fact! FWIW one-month deposits have been attracting a 21bp interest rate all year but all of a sudden yesterday we got 43bps for a one month deposit, hence what prompted the discussion. I suppose, thinking it through, it's likely that fewer people would now want a Next credit account on comparatively high interest. They're more likely to pay instead using a much cheaper bank credit card. So actually, cheap & easy availability of credit from banks is likely to have hurt Next's profits from offering credit in the last few years. Therefore, if we do have another credit crunch, and banks withdraw or restrict consumer credit, then this surely creates an opportunity for Next? Next offers credit using its own resources (it has a large, internally funded debtor book), and it can offer credit on whatever terms it wants. So if banks stop offering credit so easily, this would help Next plug the gap & increase its profits. Jeremy Grime at FinnCap recently flagged up the risk that Next may not be doing proper checks on customers before offering credit. There's maybe some mis-selling risk too, and other regulatory risk. Although given how small the customer credit balances are, it's difficult to see regulators getting over-excited about this. Is the "RBG" in the title by accident? I was rushing this morning, and intended writing something about press comment over the weekend that Revolution Bars (LON:RBG) shareholders are warming to a merger deal with Deltic. Also there is a new broker note out today, saying that we should anticipate exceptional costs relating to the failed Stonegate deal & pay-off for the CEO of about £2.5m - which seems excessive to me. Probably a good thing the CEO has gone. The broker also lowered EBITDA forecasts a little, but raised EPS forecasts, due to lower depreciation & tax charges. Normally, I would agree with you. However, with Next (LON:NXT) - they tell it like it is. Hence why I focus on their quarterly updates. Also, note that the John Lewis updates confirm what NXT say. Be sceptical with companies that BS. But Next don't BS - quite the opposite, so we should sit up & take notice of what they say, because it's historically been proven to be true, and in fact, often too pessimistic. Points noted re Zotefoams (LON:ZTF) - I'll check out the product range & describe it more accurately next time. Thanks for pulling me up on this - helpful. I want the SCVRs to be as accurate as possible, so it's very helpful when readers point out anything that's not quite right. Many thanks for the explanation - that's very helpful.